Recently, double knee replacement procedure has been an increasingly common procedure in hospitals throughout the United States. 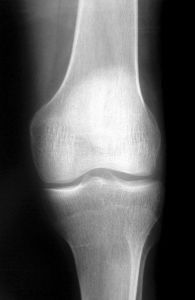 According to a recent article from Wall Street Journal, many people who suffer from osteoarthritis tend to put up with the condition until it gets to a point were it is unbearable and eventually decided to get a total knee replacement. In the typical case, both knees are stricken with osteoarthritis to the point where they both need to be replaced. This normally involved having the more painful knee replaced, and then going back later for a second operation. A double knee replacement surgery, or bilateral knee replacement, as it is technically called, offers a quicker and more cost effective alternative to having successive traditional knee replacement, but this procedure, while new, has already managed to attract a good deal of controversy. The reason for the controversy is because some evidence suggests the risks may outweigh the potential benefits. Those who perform the surgery say one of the main benefits is that it does away with the need for a second hospital stay. This reduces the amount of time spent under general anesthesia, which is always a risk, and it also reduces the risk of developing an infection following surgery. No matter how clean a hospital may be, post surgical infection is always a risk. Another one of the claimed benefits is that it reduces the need for a second complete recovery period. Recovery is a painful and emotionally difficult time for many patients, and not having to do it twice is a benefit. However, some studies seem to show that there are more complications with the bilateral procedure, as compared to successive traditional total knee replacement operations. These risks include the formation of blood clots deep within a patient’s veins that can travel to the lungs, causing a serious medical condition known as a pulmonary embolism (PE). There is also an increased risk of blood loss, resulting a greater need for blood transfusions. Interestingly, the tandem knee replacement procedures, as they are also called, can involve two surgeons working at the same time to replace both knees, or it can involve a single surgeon performing the surgeries in a sequential manner. While any surgery can involve some risks, knee replacement surgeries often involve an increased risk because of the many defectively designed artificial knees, and many personal injuries have been seen over the past several years. We have seen knees that completely fall apart, causing the need for a second surgery. We have seen artificial knees that can come loose, causing serious pain and suffering to victims. It does not matter how careful or skilled a surgeon may be if the artificial knee implant itself is defectively designed. One of the best things you can do if you have had total knee replacement in either one of both knees and have experienced pain and suffering beyond the expected period of discomfort, or have been told you would need an additional surgery to correct a problem, is to contact an experienced knee replacement injury attorney in Boston to see if you have a case against the device manufacturer.